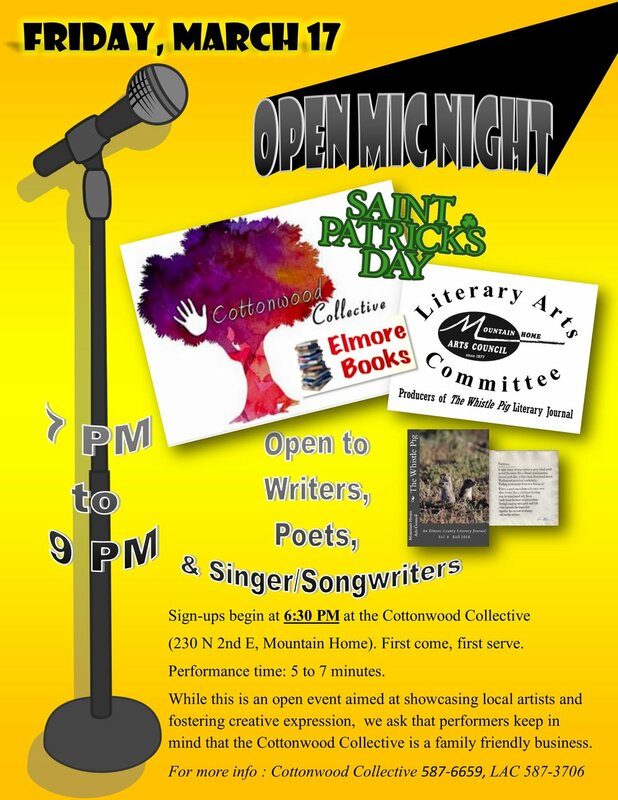 Mountain Home, ID—The Cottonwood Collective, Elmore Books, and the Literary Committee of the Mountain Home Arts Council are hosting an open mic night on Friday, March 17, in the new stage area at the back of the art, book, & collectables store (230 N 2nd E). Writers, poets, and singer/songwriters are invited to share their art. Sign-ups will begin at 6:30 pm—first come, first serve—and the program at 7 pm. While this is an open event aimed at showcasing local artists and fostering creative expression, we ask that performers keep in mind that the Cottonwood Collective is a family friendly business. Performance time: 5 to 7 minutes. The mission of the Cottonwood Collective (230 N. 2nd E. St., Mountain Home) is to promote the work of local artisans and provide the community a welcoming place to purchase exceptional gifts and discerning fine art; to create a comfortable place to gather and to learn through classes, events, and shared conversations. Elmore Books & More sells new and used books. For more information, contact the Cottonwood Collective at 587-6659. The Mountain Home Arts Council entertains, enriches, and educates the community by promoting and presenting varied artistic and cultural events. For our full season of events or other information, please visit our website, www.mharts.org, find us on Facebook or call the Arts Council office at 587-3706.